Sidonia Alenuma-Nimoh updated their profile information. Sidonia Alenuma-Nimoh changed their profile image. 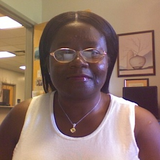 Sidonia Alenuma-Nimoh commented on an update Auto-biography in the making: A trip to the ivory tower? in Diversity in Organizations, Communities, and Nations. Sidonia Alenuma-Nimoh created the update Auto-biography in the making: A trip to the ivory tower?.